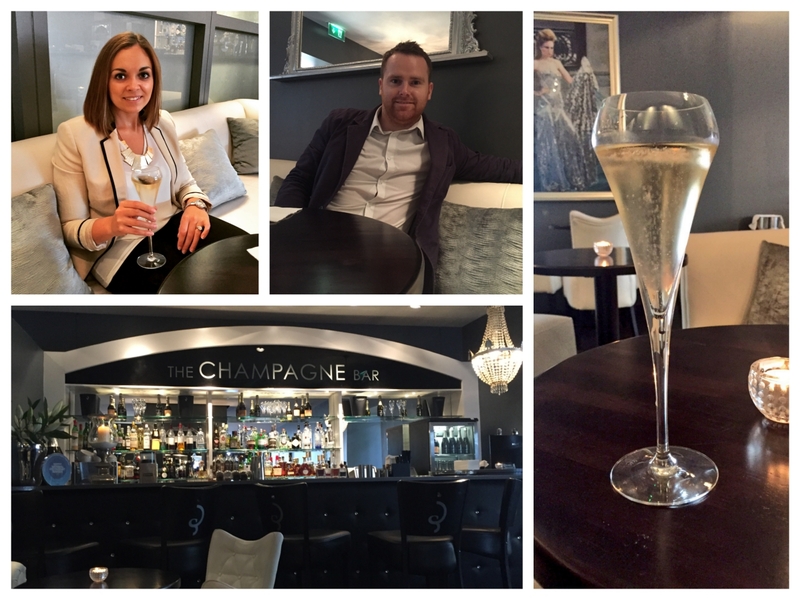 Last Friday we visited one of Northern Ireland’s top restaurants, if not thee top restaurant, Deanes EIPIC. Deanes EIPIC is the flagship restaurant of celebrated top local chef Michael Deane, and was recently awarded its first Michelin star, along with another Belfast restaurant, OX. EIPIC is one of seven restaurants owned by Michael Deane and was recently named in the top 100 UK restaurants at the 2016 National Restaurant Awards, Northern Ireland’s only representative at position 83. EIPIC was also listed the La Liste top 1000 restaurants in the world, coming in at 708, one of only two restaurants from Northern Ireland to make the list (the other being The Boathouse in Bangor, which was ranked 831st). We had booked online and were looking forward to experiencing the £40 tasting menu. Deanes EIPIC is located on Howard Street alongside Deanes Love Fish and Deanes Meat Locker and upon arrival, we entered through Deanes Love Fish and the restaurant was midway through a busy lunch serving. We were greeted by the front of house, Didier, who took us through to EIPIC were he informed us that we were the only lunch booking, which provided us with an even more memorable dining experience. It appears Friday lunchtime is one of the quieter times for dining at EIPIC, as evenings and weekend sittings can sometimes require advanced bookings of up to six weeks! We took a seat at the Champagne Bar and enjoyed a selection of hors d’oeuvre’s to begin, before taking our seat in the luxurious EIPIC dining room. 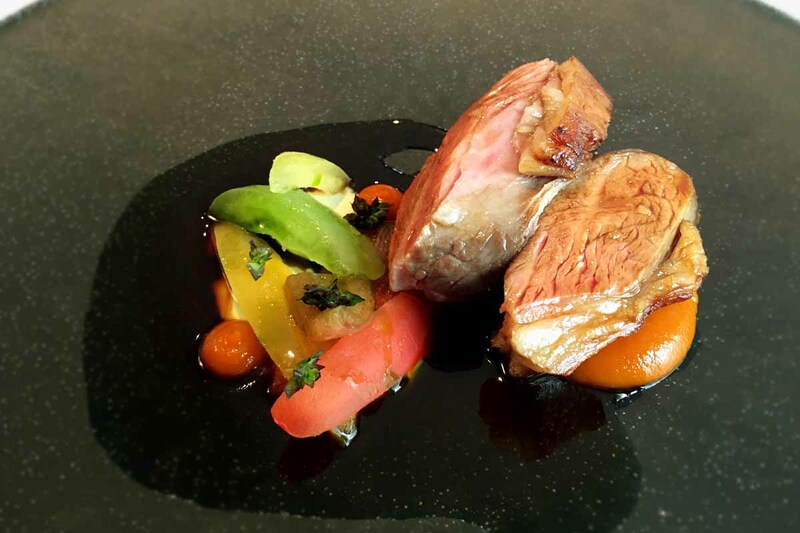 It really is a spectacular setting for dining out, and with the food that followed, and attention to detail of Didier and his team, it’s easy to see just why Michael Deane and EIPIC are once again helping to put Northern Ireland on the culinary map. Of course, it’s not all down to Michael, something the man himself was keen to stress when we caught up with him during our tasting (we’ll share some of what we talked about later in this article). Michael was full of admiration for the work of head chef Danni Barry in helping secure the much coveted Michelin star for EIPIC, and there’s no doubt the restaurant is providing the perfect foundations for this talented local chef to thrive. Indeed, Danni, who hails from the town of Mayobridge (not too far from our home town here in Newcastle), is one of a small number of female chefs in the UK to hold a Michelin star and only the second ever Northern Irish female chef to hold a Michelin star (the other being 3 Michelin star chef, Clare Smyth from Restaurant Gordon Ramsey). Danni is a former Junior Chef of the Year, and is one of a crop of talented local chefs that is helping put Belfast, and indeed Northern Ireland on the culinary scene once again. We really do have some top chefs and restaurants on our doorstep, and our advice is to get out and try these restaurants and enjoy the many different dining experiences that await you. Now, let’s talk about our exceptional tasting menu at EIPIC. While relaxing in the elegant Champagne bar, we enjoyed our first taste of what lay ahead of us with two refreshingly tasty hors d’oeuvre’s. 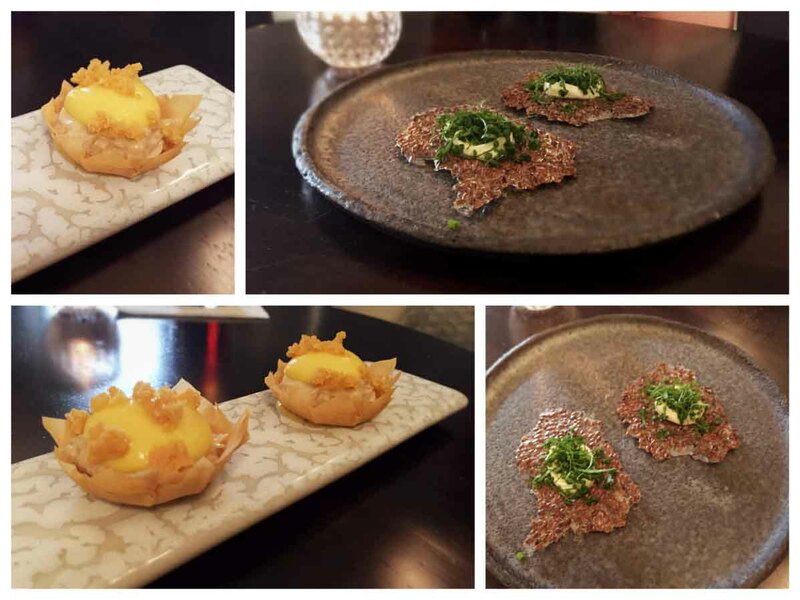 The first dish was a linseed cracker with cream cheese, chives and parsley, and the second was crab meat with sweetcorn purée and gruyere in filo pastry. The salted linseed cracker was perfectly complemented by the creamy light cheese and the fresh herbs which awakened our taste buds. Up next was the cold crab meat filo pastry which was a combination of white and brown crab meat served with a silky smooth sweetcorn purée and a crumbled gruyere in filo. This mouthful was pure heaven! Next up, the main event. 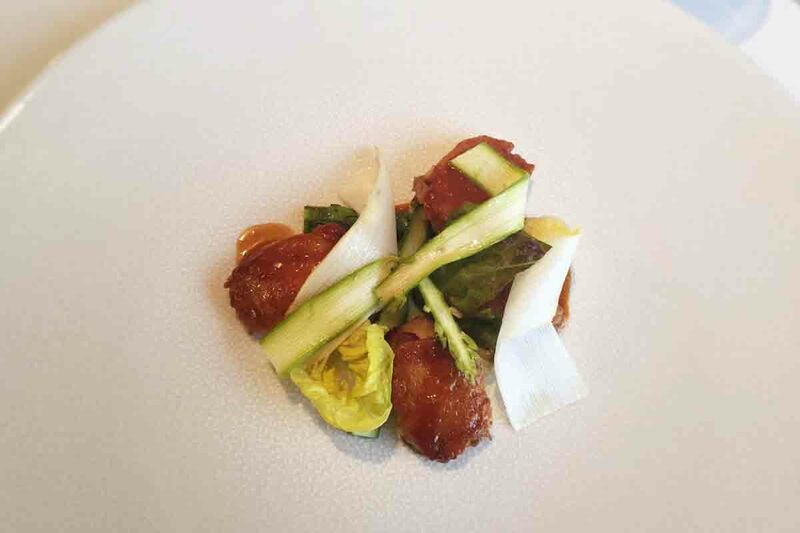 Following a selection of perfectly baked homemade breads and salted Abernethy butter (incredible by the way), we were brought our next course, confit glazed chicken wings with a celeriac purée, white and green asparagus and red & green baby gem lettuce. The chicken wings were glazed in a rich honey and soy sauce which provided the perfect amount of sweetness to accompany the celeriac purée. 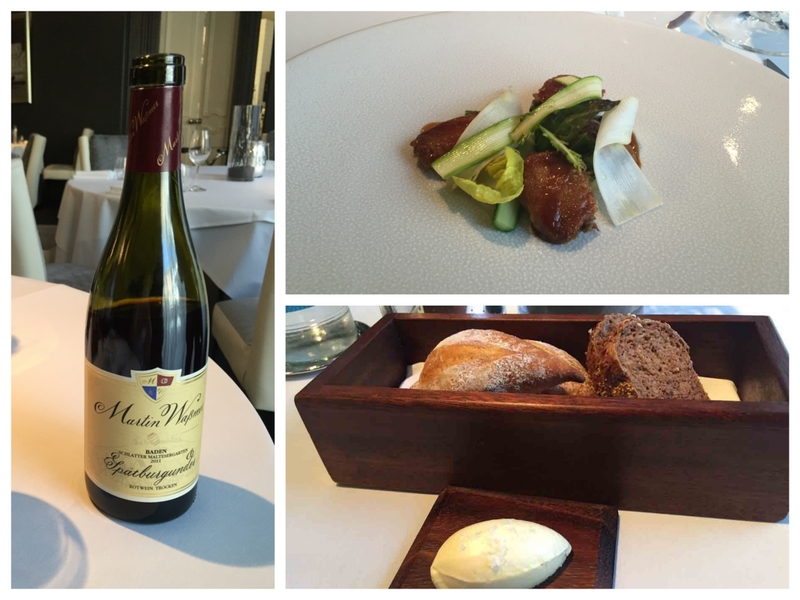 Helen enjoyed a glass of Martin Wassmer Schlatter Maltesergarten 2011 Pinot Noir which was recommended by Didier and perfectly complemented the dish, enhancing the rich flavours. This was an exceptional plate of food, the wings were served off the bone and there was just the perfect amount on the plate. The mix of sweet and sticky chicken, smooth purée and crunchy BBQ asparagus and lettuce made each mouthful something to savour. A top class plate of food and Helen’s favourite dish of the tasting. Following on from our chicken wings, we both opted for the lamb dish for our main course (the seafood option was turbot and cauliflower in a roasted bone sauce). The lamb was served wonderfully pink with oregano herbs, a basil oil, an oregano infused yoghurt and a selection of tomatoes. The jus that was served with the dish was quite possibly the nicest jus we’ve ever enjoyed. A deep, rich sauce that was packed full of flavour, so much flavour that we had to refrain from licking our plates at the end of the meal. This was another sublime bit of cooking and once again highlighted the quality of food you can expect from EIPIC. Simple, yet quality ingredients cooked to absolute perfection and treated how they should be. This was Nial’s favourite dish of the tasting. 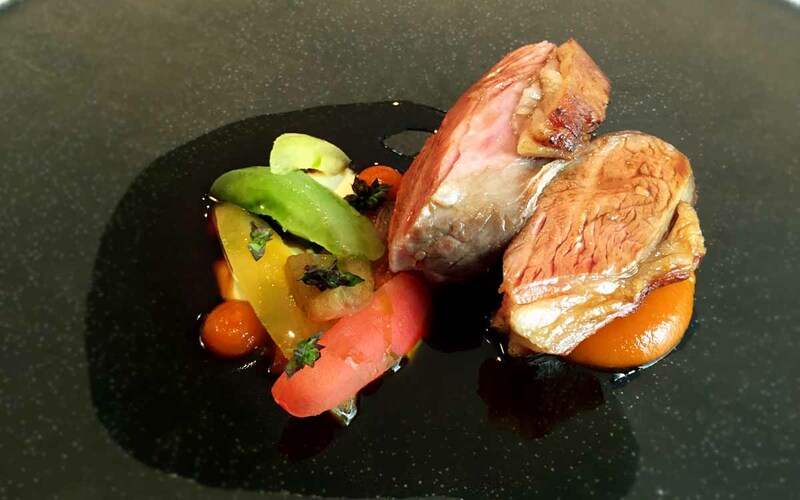 Didier paired this dish with a Coriole McLaren Vale, Nero d’Avola 2015 from South Australia. The combination of sweet wildberries, sage flowers and aniseed, made this a great partner for the lamb, with its fruity tones perfectly complementing the lamb. Following the lamb we decided to try a selection of the cheeses on offer before enjoying our dessert course. The goats cheese in ash was the highlight of the cheeses we sampled. Next up was our final course of the tasting menu (or so we thought), and this was a selection of raspberries and coconut. 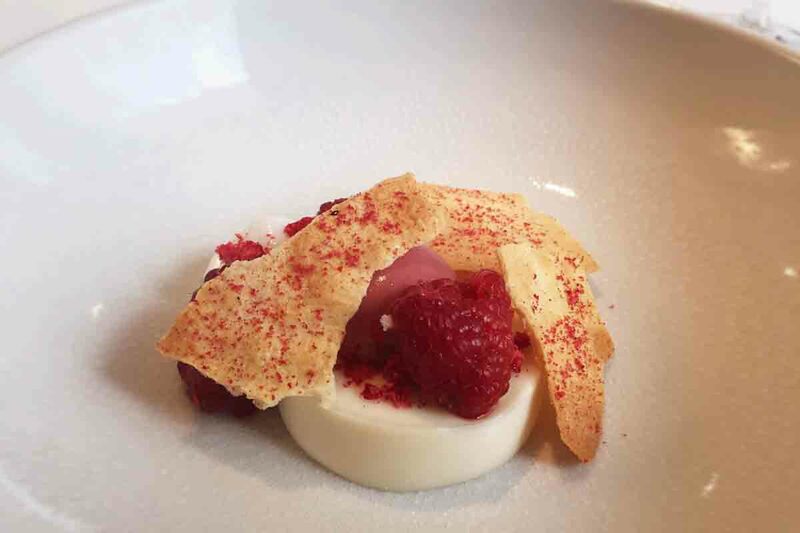 The dish consisted of a set coconut with a coconut foam and sorbet, fresh and freeze dried raspberries, a raspberry mousse and a coconut and raspberry tuille. With two core ingredients to work with, chef Danni and her team did an amazing job creating so many textures and vibrant flavours. This was a great way to finish our tasting menu and really cleansed our palettes. Regulars to the blog will know how much we enjoy our desserts and this was right up there with the very best. 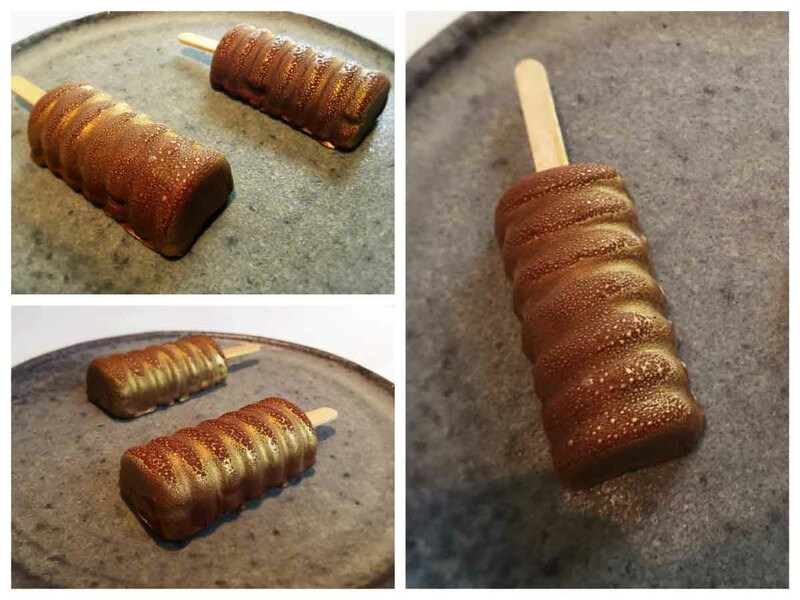 Just as we were getting ready to grab our bill and leave after an amazing tasting, we were treated to the iced honeycomb dessert which was a honeycomb infused ice-cream lollipop, with a chocolate coating. Food is all about memories and this took us right back to our childhood and honeycomb choc ice’s. Dining experiences often have a habit of bringing back memories and a sense of nostalgia, and the iced honeycomb certainly did this. A great way to end our dining experience at EIPIC, one which was epic in both name and taste. 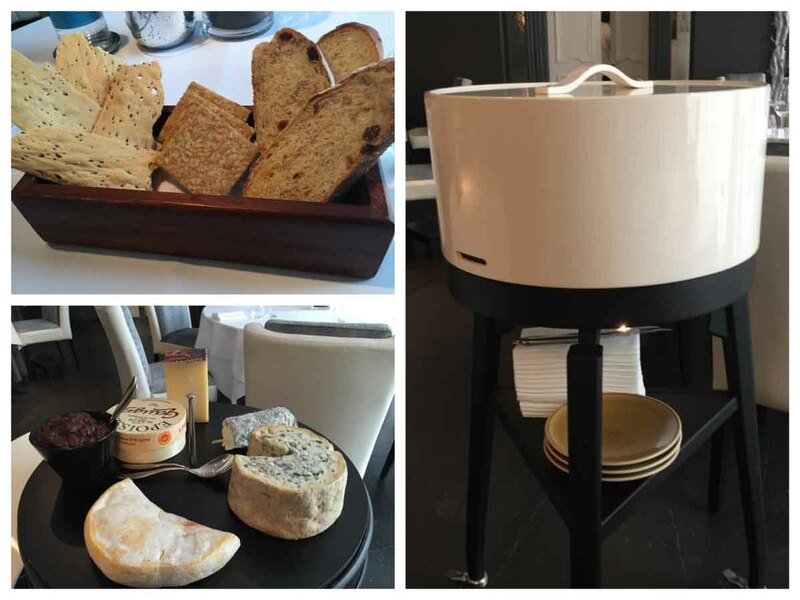 The tasting menu we opted for was the £40 menu, while the wine pairing and cheese board was an additional cost. The total cost for our EIPIC dining experience was £138.71. We appreciate this might seem a lot for two people to some of our readers, but when you consider the quality of food, the spectacular setting and the wonderful service, and the fact this is one of NI’s top restaurants, this is a cost we were more than happy to pay (although we did have a Christmas voucher which helped with the bill). We can’t recommend Deanes EIPIC enough and would confidently say it has been our best dining experience to date. As previously mentioned, there is usually a long waiting list for weekend bookings so you may need to book well in advance to grab a table, or else opt for one of the lunch sittings. We’re already looking forward to getting back and sampling future tasting menus with some friends. As our title suggests, it’s called EIPIC for a reason, and if you decide to visit EIPIC, it’s a dining experience you’ll certainly remember. 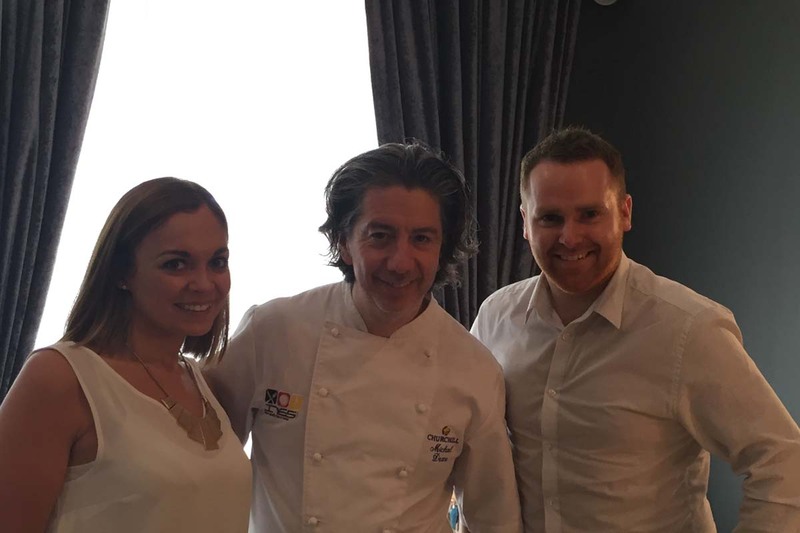 While the food and service were exceptional, the highlight of our afternoon was meeting Michael Deane himself. He took some time to stop by and have a quick chat with us, asking a few questions about the blog and sharing some insight into the EIPIC journey. We got chatting about the current food scene in Northern Ireland, and one thing Michael stressed he’d love to see more of is ethnic and diverse restaurants in Belfast. Michael discussed the need for more top quality Asian restaurants in the city while also talking about the work chef Danni Barry and the team had put in to help bring the Michelin star back to Deanes. It was great to spend a few minutes casually chatting to Northern Ireland’s top chef and get an insight into what drives his love of food. Michael came across as a really nice man who has great pride in everything that both EIPIC and the Deanes chain of restaurants stand for. We greatly appreciated the time he took to have a quick chat with us. We recently came across this interview with Michael on the award winning Taste.ie and would highly recommend reading it for those of you who are interested in finding out a little bit more about Michael, EIPIC, and what it takes to run a Michelin star restaurant. 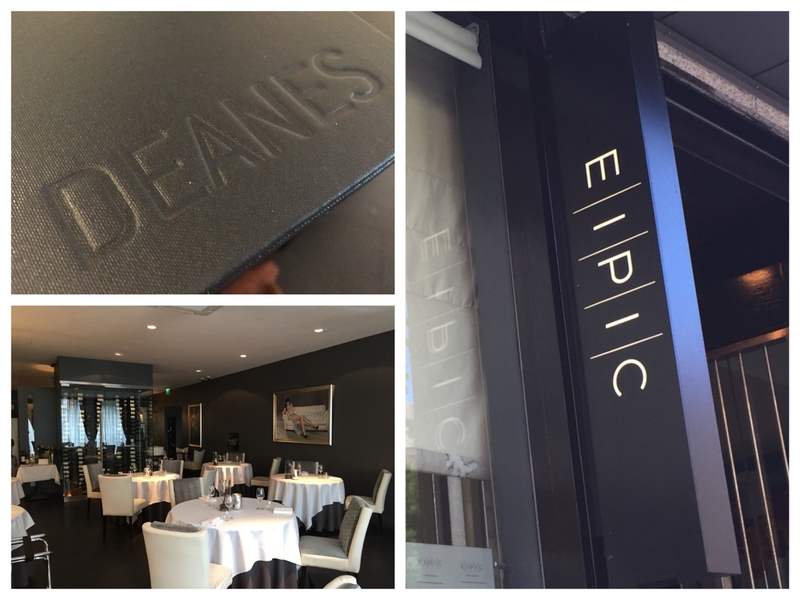 Have you enjoyed the EIPIC dining experience at Deanes? We always enjoy it when our readers share their own food and travel experiences with us, so today we want to know if you’ve ever dined at Deanes EIPIC, or any of the Deanes collection of restaurants? Let us know about your experience by commenting below or connecting with us on Facebook and Twitter. You can also keep up to date with all the latest goings on here at Pikalily by following us on Instagram and YouTube, or by signing up to our newsletter. Thanks again for stopping by guys.